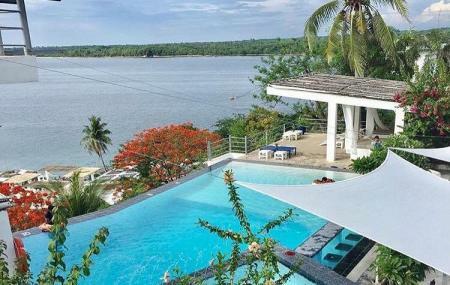 Find hotel near Sundowners Vacation Villa ..
One of the most looked-forward to attractions in Pangasinan, the Sundowners Vacation Villas is one of the most beautiful properties you will come across while exploring the city. Ideal for a day out, this sea-overlooking property is set on a lush hillside. The characteristic white and blue interiors render a very Greece-like vibe to the whole place. The resort boasts of wonderful accommodations too, that come in a wide variety. A tranquil fun place with lots of options to choose from. Personalize your visit to the city by chalking out a plan using Bolinao trip planner. You can add cozy hotels in Bolinao like Birdland Beach Club, Puerto Del Sol Beach Resort And Hotel Club, Tondol Beach Villa Vessela and Rullan Apartelle. Draft the best Bolinao vacation packages using ideal templates offered by TripHobo. Also explore how to reach Bolinao on the go! Love this? Explore the entire list of places to visit in Bolinao before you plan your trip. Fancy a good night's sleep after a tiring day? Check out where to stay in Bolinao and book an accommodation of your choice. How popular is Sundowners Vacation Villas? People normally also visit Mount Santo Tomas while planning their trip to Sundowners Vacation Villas. Was a great place to escape with the family. The villa was big enough for 9+1 infant. We have a few issues but they fixed them right away. Fast friendly with a great view. Would visit again. Love the ambiance of the place but our room was quite hot because of the inadequate airconditioning (stayed at Marina Bedroom 1). Our room's shower area also had poor drainage. Food at Nykos was adequate and reasonably priced. I recommend trying their gyros. Overall, we had a good experience and had fun taking lots of photos but definitely expecting improvements on our next stay. Very bad location. There's a market outside and a lot of people, and they can all see you having fun on your bikinis from the pool area. And yes they are all looking!! Free show for everyone! lol!! Great place to have a short vacation with your family. Although situated a bit far from towns, it's no problem if you have a transport vehicle with you. Parking could be a bit of a problem since it is pretty limited and the parking areas are a bit narrow and steep. The villa sits on top of a hill so expect climbing the stairs frequently to go where you want to. There are three pools available. 2 are on the top of the villa and one on the ground. The pool on the top ranges from 3 feet to 8 feet deep and there is a diving platform available for the 8 feet part. Life jackets are available for those who are unable to float or swim. The pool below ranges from 3 feet to 6 feet deep and overlooks a port beneath it. Not quite ideal for those who doesn't want to be looked at in their swimsuits since many of the residents there gather at the port to take a swim/traverse on to another island. There are also restobars on each pool (but quite expensive) so there's no worry in looking for somewhere to eat and drink. Buying liquor and food from the outside is allowed by the villa (there is a store nearby the villa). For their rooms, we stayed a night in their Chief Villa which is situated at the middle of the hill. Don't bother to bring cookware and utensils as each villa provides you with many (you could request for more if it's insufficient). There is a microwave oven, an oven, a stove, and a refrigerator readily available for you to use. The Chief Villa has one master bedroom with one bathroom available, and 4 bunk beds in the living room that could accommodate 6 persons. Each rooms get 1 window type air conditioner although the living room one is a bit weak as the room is spacious. There is also a veranda which could also be a sleeping quarter. For those who wants to unwind, there are gathering areas that have a hammock and swings. They also offer music while you take a swim (they even put it in their reminders) so I guess that's one of their services. We could say, the service is fine since we didn't have any problems with our room. We only requested additional towels (they are provided) and a sleeping mat. For those of you who wanted a beach near the villa, sad to say, there is one. But it is the port. If you happen to have a vehicle (which of course you probably have since you can afford to be here), an hour of drive to Patar Beach is recommended. It is also free though you have to pay for the parking fee. Overall, it felt like a vacation. No problems at all. Got beach house room near pool 3. Rooms is too big for 6. You can additional people for an extra charge. Enjoyed our weekend stay here.